Swearing in the USA, drinking in the day and smoking in The Clarence. When will those rock stars behave like ordinary decent folk, eh? 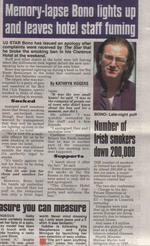 According to Irish news rag ‘The Star’, Bono breached his country’s radical new smoking laws last week when he lit up in his own gaff. The paper claims Clarence hotel staff reminded their ‘boss’ that smoking isn’t allowed on the premises. Bono had been entertaining the Red Hot Chili Peppers in the hotel’s Tea Rooms.